Are we making our dogs more fearful? "A few years ago, I did a parachute jump for charity. During the training we were told it wasn’t uncommon that if there was only one possible obstacle in the way (like a shed or a tree) someone would hit it. The only rule was ‘don’t hit the tree’ but time and time again, people hit the tree, even though there were acres of empty space all around it. "This so-called (and well documented) ‘target fixation’ occurs in other places too, and fighter pilots, racing car drivers, and motorcyclists all run into this phenomenon by which they cause the very thing they are most fearful of, and hit the thing they are trying desperately hard to avoid. "When it comes to our dogs, however, we may well have our own version of target fixation. We are so determined to have well-balanced, sociable dogs that we do everything we can to ensure this, from puppy parties to training classes, to endless socialisation, but, despite this, the behaviour of dogs in the UK seems to be getting worse, with behaviourists seeing more and more reactive or fearful dogs. Is it just that our expectations are too high — or are we actually creating the very problems we are trying so hard to prevent? "There’s probably no one answer, and instead the reality is, in all likelihood, a combination of factors. First, we expect our dogs to live as part of the family in a way we never have before. We expect them to interact with everyone in the household in a totally positive way, no matter how they are handled, to come everywhere with us, and to accept, and indeed be happy with, all manner of situations, experiences, and encounters. "While lots of dogs thrive on this, for many this is just too much pressure, and often we have unrealistic expectations. To make things even tougher for them, family life has got increasingly less dog friendly, with dogs being routinely left alone for long periods and having to cope with more stress and anxiety than at any time in the past. So already we have dogs feeling the strain of modern living who may, as a result, be in a state of totally unnoticed low-level anxiety much of the time." "Next throw into the mix our knowledge of socialisation and habituation. Most owners are aware that puppies need socialising — and there are any number of charts and lists of all the things they need to encounter and experience while they are in their early weeks of age. Socialisation and habituation is, without doubt, important in raising a well-balanced, sociable dog who’s able to accept all the things that family life will throw at him, but, for this to succeed, it isn’t what we do that matters so much as how we do it. "In these early weeks, we are teaching puppies what is safe; those things that are going to be a part of their new life and are nothing to worry about. We will also be introducing them to people and dogs they can play and be sociable with. Often, however, we forget that at this time dogs are also learning and making judgements about what isn’t safe; what is worrying, concerning, stressful, scary. "As young puppies they may not have the emotional range, the confidence, or the ability to react, but they are making associations that will last into the future. In our well-meaning attempts to socialise, we may instead unwittingly force them into situations that frighten or worry them, or put them in situations where they have to interact with dogs who push them around or intimidate them. This isn’t socialisation; this is early sensitisation. "In other words, if we don’t truly make these experiences and encounters fun and enjoyable for our puppies, we are actually just introducing them to lots of things that they will view as being scary now and into the future. Once they grow up into adolescent dogs with a full range of behaviours, more strength and confidence, and the ability to react, they may well behave reactively or aggressively towards them. Anything that produces a negative response (such as fear) will not habituate, instead it will sensitise!" "As our dogs grow older, we often forget that adolescent dogs have one or more additional fear phases when things that they apparently took in their stride before (or maybe they didn’t but no one noticed!) suddenly produce a fearful or reactive response. "Often at this time, we don’t respond well to these unexpected behaviours — assuming our teenage dog is ‘acting out’ when actually they are going through an important developmental phase that coincides with growth or hormone spurts, as they learn how to relate to the world as an adult and not a juvenile. Negative reactions from the owner at this time combine to make a worrying situation or experience even worse for the dog, and confirm his fears. "This is a time when single-event learning can be a very definite thing. An adult, without the backing of a parent, needs to learn immediate lessons with regard to what is dangerous if they want to survive, and so a scary encounter at this time can produce lasting behavioural strategies, even if previous and subsequent encounters are positive. 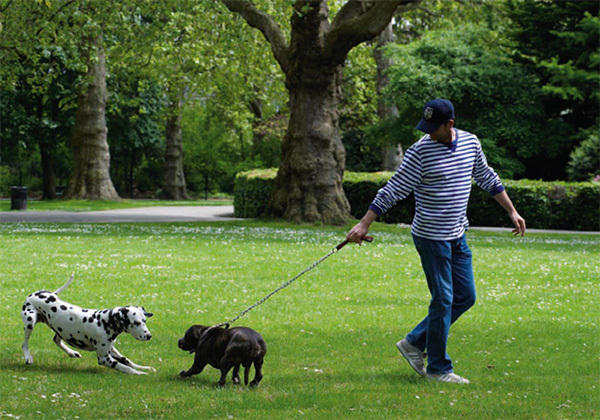 As the dog no longer looks like a puppy, owners tend to think their dog is all grown up, drag him all over the place, let him charge around in the park with all kinds of unknown dogs, or take him to inappropriate training classes full of reactive or equally fearful dogs. All of these things may be done for the right reasons, but produce entirely the wrong results. "And so, are we responsible for creating the very things we are trying to prevent? In many cases, yes, we are. We have the best of intentions, and a grasp of canine behaviour, but not enough to understand that (as I have said many times! ): ‘it ain’t what you do, it’s the way that you do it’." Make sure your puppy comes from a breeder who really understands socialisation and habituation. Choose your puppy parties, playgroups, and socialisation opportunities wisely. Be mindful — don’t just ‘tick boxes’ when it comes to socialisation. It’s far more important that you consider your puppy’s emotions and his learning experience, not just have something else marked off the list. Avoid interactions with any dogs you don’t know or know to be truly friendly. Make sure their play styles match your dog’s own, so he will not be intimidated, bullied, hurt, or worried (or, in turn, worry the other dog). Proactively set up these positive meetings, don’t just rely on chance. Don’t expect that a ‘socialised dog’ will play with all other strange dogs they see! This is how accidents happen and single-event learning. A ‘well socialised dog’ should be happy to play with friends he knows, but, far more importantly, should be happy to pay attention to you in the presence of other dogs — that should be your number one socialisation goal. Visit any training classes you plan to attend without your dog initially. Are they well run, welcoming, and controlled, with friendly dogs? If there are any reactive dogs shouting from the corners, run away! If you are unsure, it is better that your puppy has no experience rather than a bad experience (and it’s not you who decides whether it is a ‘bad experience’; it’s your puppy’s view!). Look at the world from your dog’s point of view. Do not belittle his fears, his worries, or his anxieties — whatever his age. Recognise them because to him they are real. Don’t force him to ‘face his fears’ because that just creates more fear — and breaks down trust! Be mindful. Think about how your dog is feeling, what he is learning, and if it is a positive experience that will teach him that this situation is safe. All the time think ‘how can I make you feel better?’ and you are not going to go far wrong.